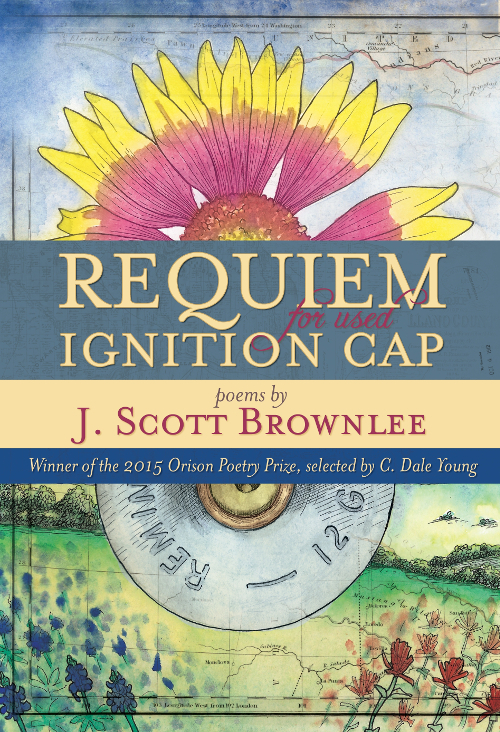 Requiem for Used Ignition Cap, by J. Scott Brownlee. Asheville, North Carolina: Orison Books, November 2015. 76 pages. $16.00, paper. & then said nothing to the river. Whereas many writers who set their work in small towns strive to creative idealized versions of these places, Brownlee opens the book up by letting the reader know that this is not his plan, that these poems won’t ignore the violence that underlies these experiences. The poem goes on to discuss other suicides—an Iraq War veteran and the speaker’s aunt. There’s a darkness to the poem, but it doesn’t wallow long in that darkness, instead raising its diction as a way of elevating the speaker out of the muck, then ending with an image of a father and son, alive and fishing together, pulling sustenance from the same river that had taken away three lives. This is one of Brownlee’s real strengths—an ability to elevate the poem, to find sparks of humanity and hopefulness in the seemingly hopeless world. In “The Gospel According to Addicts in Llano, Texas,” the “we” speakers describe themselves making meth and blowing up their homes. For many poets, this would be a moment of warning, or a moment of judgment, but Brownlee instead writes “Our homes each exploded. We stood outside them / in the dark—choirs of sirens closing in, bright red / and blue lights bathing us—and could not believe it.” Loss becomes a chance for addicts to witness what, in a sense, is a miracle—the speakers compare this moment of surprise to the story of Jesus raising a man from the dead. By juxtaposing faith with the manufacturing of meth, by placing these two unlike things side-by-side, Brownlee elevates one while also bringing the other one closer to Earth. the nest she tends in a live oak’s branches. Even so, she is there. & I am here. & neither of us needs a hymnal to take turns singing. Ritualistic actions become their own type of religion. This repeats throughout the collection. In “Doe Rapture,” deer hunting takes on these religious undertones. In “Wildflower Suite,” a poem in seven parts, the flowers that bloom on the roadsides of Texas take on this importance. In “Elegy for Soldier Who Returned Without a Voice from the War in Iraq,” it’s memories of the way the high school quarterback was worshipped. Over and over again, Brownlee takes rituals and turns them into moments that can be read as religious, a strong move in the work that illuminates many of the facets of small town life. Requiem for Used Gas Cap is, above anything, an important look at how faith plays out in the towns of central Texas, how it permeates everything. Pastures used as signs of God’s influence, manual labor as a way of comparing people Christ. This all-encompassing faith is often deeply flawed—the addicts comparing their meth explosion to Christ, frozen Dairy Queen Blizzards as a sign of God—but it’s there. It’s always there. Inescapable. Brownlee knows this. These poems know this. Again and again, they remind the reader of the importance of trying to understand a place, of trying to fully articulate all the intricate details of whatever it is “home” really means. Justin Carter is a PhD student at University of North Texas. He has an MFA from Bowling Green State University. He co-edits Banango Street and is Reviews Editor for Mid-American Review.